Fashion-forward friends Neil Blumenthal, David Gilboa, Andrew Hunt and Jeffrey Raider aren't your bargain-basement eyewear types. The four University of Pennsylvania Wharton School of business alumni always preferred designer frames and lenses that ran about $500 per pair--a fact they lamented. "Most glasses are marked up between 10 and 20 times what they cost to manufacture, and that just didn't make any sense to us," Blumenthal says. So they set out to refocus the industry. 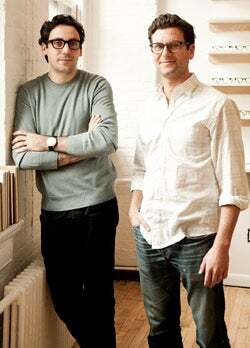 The four started New York-based company Warby Parker (named for literary iconoclast Jack Kerouac's characters Zagg Parker and Warby Pepper) and set out to design, manufacture and distribute high-quality eyeglasses that would compete with those of major designers, with a retail price of only $95. The former director of the New York nonprofit VisionSpring, Blumenthal had spent five years giving away glasses to impoverished people. Those industry contacts not only helped him line up manufacturing and distribution resources, but that philanthropic focus also led the partners to adopt a one-for-one donation model: For every pair of eyeglasses sold, one pair would be donated to someone in need. Today, Warby Parker offers 50 upscale eyeglass and sunglass designs, plus one monocle design. The challenge over the past year has been keeping product in stock, according to Blumenthal. Editorial coverage in Vogue, Vanity Fair and GQ has helped orders to skyrocket, Gilboa says, as has word-of-mouth. In fact, more than 50 percent of new orders come through referrals. But the team has resisted raising funding beyond its initial efforts from a variety of high-powered angel investors, including Joel Horowitz, former CEO of Tommy Hilfiger; Ashton Kutcher; Lady Gaga manager Troy Carter; and Ari Emanuel, CEO of talent agency William Morris Endeavor. Ironically, the more Warby Parker turned down venture interest, the more it was pursued, Gilboa says. At the same time, Lee Fixel, managing director of New York VC firm Tiger Global Management, heard friends raving about Warby Parker. He reached out through his contacts and was impressed by Gilboa and Blumenthal. "They had developed great products and figured out new and cost-efficient ways to build and market them," Fixel says. "This is a large industry that has been starved for innovation." In turn, the Warby Parker team was impressed with Tiger Global's experience with e-commerce companies. Tiger Global led Warby Parker's $12 million Series A funding round, which closed in September. Gilboa says the money will be used to build out the company's technology, including enhancing the buying experience for customers. Investment will also be made in the supply chain, in a move to reduce delivery times and ensure that inventory keeps up with demand. The firm is working on forming "deep partnerships" with suppliers and has reduced the typical turnaround time for a new frame order from 150 days to half that, with ambitions to move even faster. Warby Parker is also working to ensure that suppliers have dedicated production facilities to meet the growing order volume. It recently became a certified B Corporation and purports to be one of the few carbon-neutral eyewear brands in the world. "It was important to the four of us," Blumenthal says, "that if we were going to dedicate our life savings and our time to building an organization, we wanted to have a positive impact."